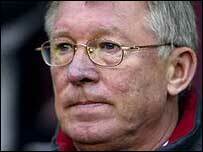 Manchester United boss Sir Alex Ferguson has called for football boots with bladed studs to be banned. Ferguson is convinced the blades are responsible for the broken foot bone which will sideline skipper Roy Keane for two months. He said: "The shot of the injury shows the shape of a blade stud on Roy's foot. The bladed studs are a danger. "We have strong views about this, we don't allow our players to wear them as they can cause serious injuries." Ferguson branded bladed boots as a dangerous fad and has approached United's kit providers Nike, who are one of the manufacturers of such boots. He said: "It's one of those gimmicks that come along. They're trying to sell them to kids, that's the problem with them. "We have not spoken to the Football Association as I am not sure they can do much. 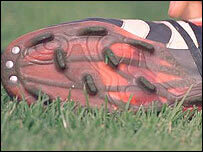 "It's up to the clubs but I know a lot of them are refusing to allow players to wear them. "We have photographs in the dressing room of some of the injuries caused by blades. Some of our academy boys had bad injuries, including some terrible facial injuries. "We have spoken with Nike about it. Hopefully the fad will evaporate and they will think of something else."